Last night I read all of the 27 indexed citings of Kahn, L. within Tafuri's Theories and History of Architecture (1976), and [wouldn't it be neat when all texts are availble as ebooks you could then customize the order of the texts by order of index because] a somewhat revealing subtext manifest itself, like a strong, contiguous thread of thought came more and more into full focus. This will be further analyzed once all the passages are compiled and pieced 'chronologically' together. This morning I read (again) a good bit of Biraghi's "Kahn as Destroyer" which begins with an analysis/interpretation of Tafuri's first published critique of Kahn's work--"Storicita di Louis Kahn" (1964)--which, from what I can gather, is a critique of Kahn's work via a review of Vincent Scully's Louis I. Kahn. One would hope that Tafuri could read English, but there was certainly nothing stopping him from scrutinizing all the numerous images that chronical Kahn's work up to that point along with some examples of historical context and/or inspiration. Thus, while looking at the images within Scully's Louis I. Kahn now, and at the same time being well aware of Tafuri's writings on Kahn, you can see what is the greater inspiration behind Tafuri's whole critique of contemporary architecture and 'history', even to the point where it was indeed Kahn that lead Tafuri to his 'analysis' of Piranesi's Campo Marzio. I'm still in the process of absorbing all this myself, but it turns out Kahn wasn't the 'destroyer', rather he was the inspiration to Tafuri's counterpoint. Basically, without Kahn the counterpoint would never have happened. 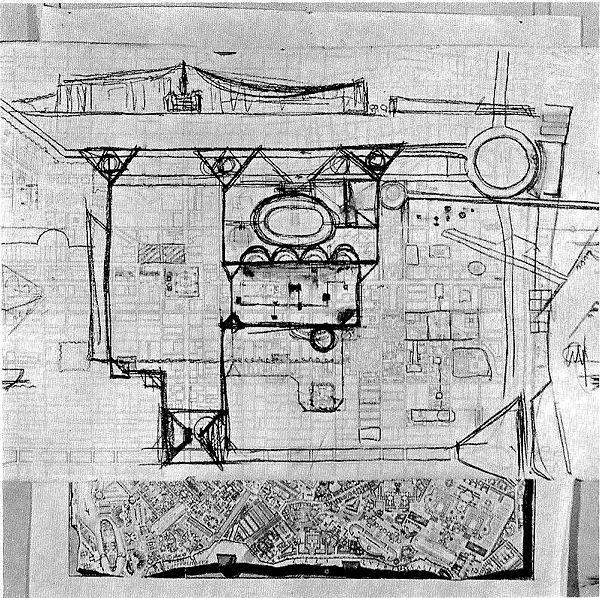 Two images of Piranesi's Campo Marzio appear within Scully's Louis I. Kahn: first the plan on its own, and second the plan with a Kahn sketch of Market Street East Redevelopment Project hanging over it. Tafuri first presented the paper "Giovan Battista Piranesi. L'Architettura come 'utopia negativa' in 1970.